Though many pet-stores display their chameleons in aquariums or glass cages, these animals require well ventilated cages for long-term maintenance. Additionally, if your chameleon sees reflections of itself on the glass, it can cause great stress to the animal. Making your own screened cage isn't hard, and can be done for a minimal cost. As this cage is cylindrical, and doesn't require a frame, very few tools are needed. 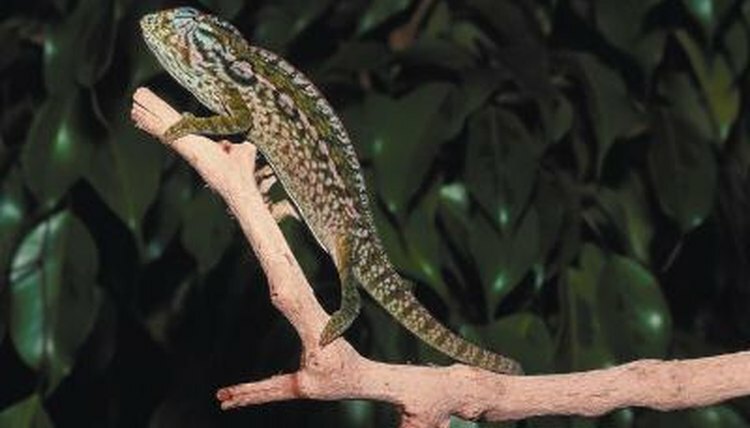 A four-foot tall cage is adequate for small to medium sized chameleons, and can be placed in an elevated position to make the chameleon feel like it is high in a tree. Measure out approximately 80 inches of hardware cloth. Cut the cloth off with wire cutters, being careful not to leave sharp edges. Wrap the hardware cloth into cylinder with a 24-inch diameter, which will give you about four inches of overlap. Hold the cylinder in place temporarily using the twist ties. Test to make sure that the plastic planters will fit on both ends of the cylinder before continuing. While testing the cylinder, trace the inside of the cylinder onto the plant saucer that will be the bottom of the cage using a black marker. Put the saucers aside after ensuring their fit, and continue with the cylinder. Fix the cylinder in place using zip ties. Starting in one lower corner of the overlapped area, thread a zip tie from the outside of the cylinder, inside through both layers of cloth, back outside both layers of cloth, and cinch it together tightly. Move up three to four inches, thread another zip tie through the seam, and cinch it together tightly. Continue this process up one seam, and then do it again up the opposite edge of the overlapped section. When complete, you should have a sturdy cylinder, with two rows of zip ties, holding it in place. Place the door opposite to the seam for maximum stability. Spin the cylinder around so that the overlapped portion is facing away from you. Measure out a section two feet tall and one foot wide in the middle of the cylinder. Mark the four corners with twist ties. Cut along the top, bottom and one side of the area using the wire cutters. Pull the freed door outwards, and bend it back along the spine of the door. The door will now tend to open, unless held shut by the rubber band-latch. Cut the plastic tubing into four 12-inch sections and two 24-inch sections, Slice each piece of tubing longitudinally through one side, so that it will fit around the edge of the hardware cloth. Place the plastic tubing on the three exposed edges of the door, and the three exposed edges of the frame. Some tubing will stay in place by itself, but it can be zip tied into place if you prefer. Thread a section of the rubber band through a section of the door and pull a loop of the rubber band through itself to tighten it. Bend the paperclip into a hook, and attach it to the free end of the rubber band. When the door is closed, the rubber band can be pulled taught and hooked to the cylinder to keep it shut tightly. To open the door, simply unhook the paperclip, release the tension and the door will open. Place the bottom saucer on the ground, face up as though a plant were to be placed in it. Drill holes through the saucer to allow zip ties to be passed up through a hole in the bottom, around a section of hardware cloth, back down through another hole, and finally back out the bottom of the saucer, where it will be cinched tightly. Drill the outer holes through the bottom of the saucer along the outside of the black circle you made while testing the cylinder. Make eight even holes along the circumference. Drill a second series of holes about 1/4 inch inside the first circle. You should now have 16 holes total. Put the cylinder into the bottom saucer. Thread the zip ties down through a hole on the outer row, back up through the corresponding inside hole, and cinch it closed around a section of hardware cloth. Continue for all eight sets of holes. You may need to lift the cage off the floor, and stick your arm through the door to complete the process. When you are finished, the bottom will be attached securely to the cylinder. Place the top saucer down on the cylinder, so that it can be removed for access. Typically, chameleons will not be able to push the lid off, but a small weight can be placed on top if you are nervous. Some keepers drill a small hole in the lid where are drip-container is placed; in these cases, the weight of the water will be more than enough to prevent your lizard from lifting the top. Add a small planted ficus and a few branches for climbing, attach the food cup to the side of the cage with a twist tie, and your cage is ready to use. For maintenance, simply place the lizard in a temporary cage, take the cage outside and simply hose it down.  Though three square feet isn't big enough for large species, these plans could be scaled up by using larger saucers to increase the diameter. ⚠ Though screen cages can be used outside, always be sure to provide a shaded area for your lizards.